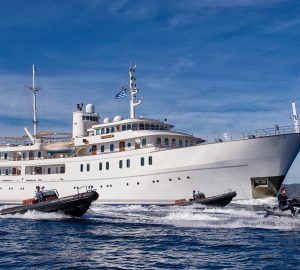 The Cannes Film Festival, which takes place around May every year, is the most famous film festival in the world and the only one where private charter yachts serve as luxury accommodation, floating offices and entertainment centers. Normally, a luxury yacht will moor right in the inner harbour, along side the Palais des Festivals Cannes, without leaving its berth - although berths are at a premium for the event and authority is required from the port many months in advance. Here are the charter yachts available for this year. 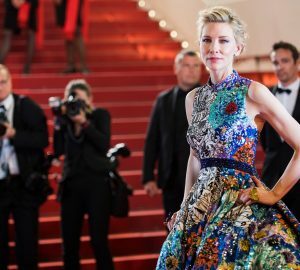 Every year in May, Cannes plays host to the entertainment world, as the film industry congregates for ten action packed days to attend screenings and awards, and to network for investment and promotion of the year’s most promising productions. The best way to organise luxury accommodation for the Cannes Film Festival is to charter a superyacht right at the venue, so that you can stay and entertain in style. Every year movie companies, producers and stars alike hire yachts to stay on during the Cannes Film Festival. Although Cannes is “the granddaddy of all film festivals” and is graced by the biggest stars and industry leaders Cannes is nevertheless a working festival. With the glamour comes a multi-billion-dollar movie industry with many industry professional hard at work making deals and contacts behind the scenes. Producers, directors, screenwriters, and financial brokers are all there to get things done. At the old port the sheer size and number of yachts, in such close proximity, makes the port of Cannes seem like a hotel for luxury yachts. This is where many of the VIPs stay and many of the private parties and private deals take place. Formal presentations take place in the Palais des Festivals just off the Croisette, while screenings and parties abound all over Cannes, in exclusive hotels, beach parties and, of course, many of the world’s finest yachts, gathered in the famous old port next to the Palais. Chartering a yacht has been in vogue since the very beginning of the Festival’s history in 1946, and it remains the most glamorous setting for promoting your company during this high profile event. A luxury yacht offers the ideal base for companies during the Film Festival, offering easy access to all the main events, as well as great impact for your branding in this highly visible location. By day the yacht can be used for private meetings and screenings, with catering provided by the professional Crew on board. By night, the yacht becomes a chic venue for hosting cocktails, dinners and parties, with all the service and trimmings of a top club. Based locally in the South of France, CharterWorld can offer you the best charter yachts in the region, at the very best rates, to suit all styles and budgets. 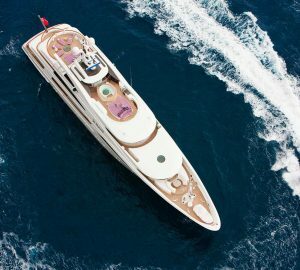 See some of the Charter Yachts available this yeear for the Cannes Film Festival here. Chartering a yacht as a base for entertaining during the Film Festival gives you the perfect venue to showcase your company, where your branding is highly visible right in the middle of the action. At CharterWorld we can assist you with local contacts for printing and branding, and also arrange tent hire and other services as required. We can also organize all your catering requirements, either with the yacht’s Chef or in conjunction with outside caterers for larger receptions. For parties, we can also put you in touch with local DJs and professional acts for all your entertainment needs. Chartering a yacht to host a special event is a popular choice during the Film Festival. If you want to host a lavish reception for your clients, you can charter a larger sailing or motor yacht for the day or evening. 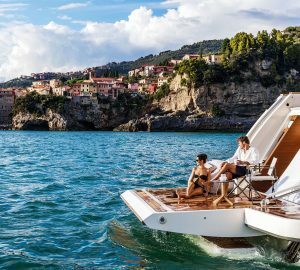 There are some beautiful yachts ideally suited for cocktail receptions and parties, having vast deck space and all the technical expertise for on board entertainment. Some are able to host up to 200 guests in port, while a few also have special licenses for larger groups at sea (above the usual maximum of 12 guests). Alternatively you could host a party at anchor along the bay of Cannes, just opposite the Croisette. Chartering a yacht for accommodation offers a novel and practical alternative to finding a hotel. Cannes hotels typically fill up every year as early as six months prior to the Film Festival, and delegates are then forced to commute from Nice or elsewhere, wasting precious time in traffic. Chartering a yacht puts you right in the middle of the event and provides the perfect venue for hosting meetings. You can stay in the old port, next to the Palais, or in Port Canto just to the east of the Croisette, next to the Casino and some of the most exclusive night clubs in Cannes. IMPORTANT: If you require a berth in the old port of Cannes next to the Palais des Festivals during an event, CharterWorld must submit a berth application on your behalf to the port of Cannes well in advance as spaces are limited. We recommend that you book the yacht charter at least five months prior to the event as the berth application requires a signed charter contract. This is especially important for the Cannes Film Festival and also MIPIM in March. Experience the ultimate Cannes Film Festival accommodation aboard your own staffed luxury yacht. Ideal for either private individuals to corporate or large groups. Relax in the very proximate Cannes harbour and enjoy the finest wine food and service. To enquire about a luxury yacht for the Cannes Film Festival please contact us here. A charter broker will get back to you immediately to organise your luxury yacht accommodation and entertainment.